Is your life is a little hectic these days? Like you wish you could just slow the heck down and savor it all a bit more, but that getting to a simplified state seems like it’s an almost impossible task? I think all too often, we can get caught up in the idea of needing to make big changes in our lives in order to experience big results. In my experience, I’ve found that sometimes the smallest of changes are what make the biggest impact over time. It helps that they are much easier to implement too and seem more doable to fit into our busy lives when they only take a few minutes of our time. It’s great to want to downsize and simplify your life, but if you find yourself never actually starting that huge process, it can be really discouraging when the desire to simplify is there, but you just can’t seem to make it happen. 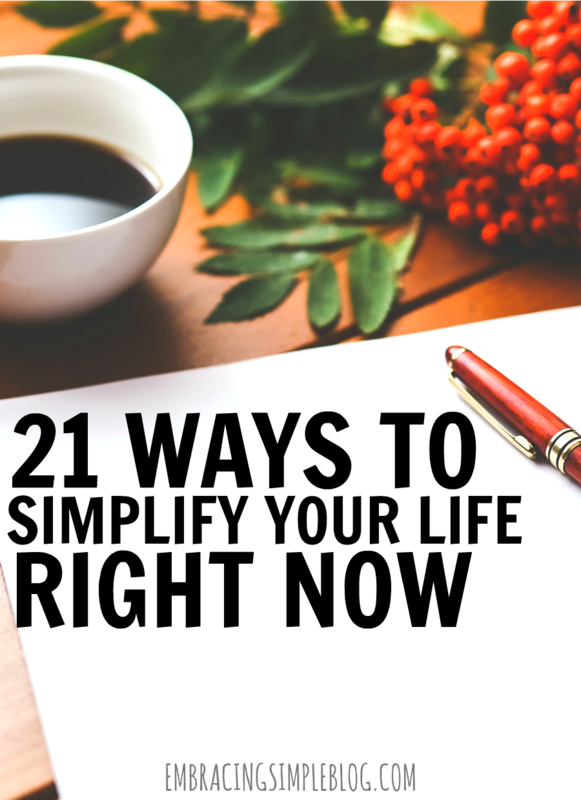 Today I’m sharing a few ways to simplify your life right now that don’t require too much of your time, but will still reap you awesome results. Doing this one thing has brought so much peace to my life. I share more about how I implemented the tips I learned from the Makeover Your Mornings course in this post to turn my mornings around, and I cannot recommend creating a morning routine enough. It is a game changer, especially if you have kids! How many times do you bring in the mail and just leave it on the counter, only to finally sort it days later? I’ve found that rifling through the mail as I walk up the driveway, and then immediately recycling all the junk mail keeps that clutter off of our counters for good. It’s also great because then I don’t give myself enough time to look through the latest Pottery Barn Kids catalog and want to buy everything 😉 . Boom, instant savings too! I realize that this isn’t always the easiest when you have small children, but I find that doing a complete load of laundry all at once makes doing laundry alltogether not seem like such a chore. I try to fold and put everything away as soon as the dryer finishes its cycle, which decreases the chance for things to get wrinkly and completely eliminates the need to iron anything. We also live in a ranch and our laundry room is the first thing you see when you walk into our house from the garage, so it’s really nice to not have piles upon piles of laundry taunting me everyday as we come and go. Unless you are already a minimalist, I am positive that there are 10 items in your closet right now that you can easily part with. It shouldn’t take you more than a few minutes and can make your closet feel so much less cluttered and overwhelming. Not sure what to keep or what to donate? Read this. Turn every single hanger in your closet backwards. Then as you wear each item and are putting it back into your closet, turn the hanger back to the correct side. All of the clothes on hangers still facing the backwards direction after 6 months should be donated, because you clearly are not wearing them. If you are feeling overwhelmed by how many plans you make for the weekend, or find yourself less than excited about going to all the events that you’ve committed yourself to, I encourage you to start saying “no” wherever possible. I love spending time with my family and friends, but as an introvert, I definitely feel drained by making too many plans for myself. I’ve learned that it’s okay to say “no” every once in awhile or suggest a different date in the near future if you find yourself needing that time for some unwinding. You know what I’m talking about, the ones that expired three years ago. Spend 10 minutes doing an overhaul of your pantry and toss everything that has expired. Not only will it free up some space, but it will help you to get a better analysis of what edible food you actually have on hand so that you can plan your meals and shopping list better. Do you want to finally start your blog? Perhaps begin a new workout routine? You need to set the time aside in your schedule to make sure that you are setting out to achieve the important dreams you want to accomplish. Put that dedicated time in your calendar right now! If your to-do list for the day is 30 items long, I can almost guarantee that you won’t be able to fit it all in today. Be realistic about what you can actually get done in one day, and have your to-do list align with that. Having over 90% of your list left after a long day of being productive won’t leave you feeling very good – let’s change that! Do you have emails from months ago sitting in your inbox? Get to Inbox Zero and feel zen again! I’m guilty of rushing so quickly while running errands or doing things around the house that I could probably knock anyone over who gets in my path. Life isn’t a race, it’s meant to be savored and enjoyed. Sometimes you need to physically slow yourself down, or you’re going to miss it! You aren’t doing yourself any favors by getting less than 5 hours of sleep per night. This is coming from someone who slept 3-4 hours almost every night for years, so trust me when I say that you will function 100% more efficiently if you get an adequate amount of shut eye. I have tried to completely cut out TV, and it just never works for me. I think I’m a bit of a TV addict! So I’ve finally comes to terms with the fact that I’m okay with watching a little bit with my hubby every night while we unwind, but I’ve definitely had to set limits for myself so I am not a total TV junkie. Setting a limit for TV time (say 30 minutes every night, for example) helps to free up your time to accomplish other things and to not just waste it all being a couch potato. Do you keep forgetting to pay certain bills on time and as a result are paying late fees and stressing about it? Automate all the bill payments you can so that this isn’t an ongoing worry. I know this is easier said than done, but caring too much about what others think leaves you in a place where you are living your life for what others think you should be, rather than what you want to be. Care less about what others think, and more about what you want. I get it, it’s hard to focus on only one thing at a time. But it can be really hard to get much of anything done well when you are bouncing around from one task to the next and aren’t giving anything your complete attention. Stop trying to do a million things at once, and I think you’ll find yourself not only producing better work, but being a lot more efficient too. If you find your mornings being complete chaos while you rush out the door to work, try setting out your clothes the night before so that you don’t even have to think about it when you wake up. This one simple change can really make a difference in how you start your day. Piles of paperwork, a million pens, tissues, lip balm, a coffee cup, notepads….these are all the things that can easily pile up on my desk on a daily basis. If you find yourself in the same predicament with a desktop cluttered with stuff, take a few minutes to clear it off before you sit down to work for the day. It will help you stay focused on the task at hand and not become distracted by your surroundings. Just like setting out your clothes the night before, packing your lunches the night before can also help you to have a more simplified morning routine with more peace and a lot less rushing around like a crazy person. Try to make your mornings as easy as possible so that you aren’t starting your day frazzled! Seriously, stop the insanity. Do you really need to be perusing the clearance rack every time you go to Target? I know, that shirt would look adorable on you, but you really don’t need it. Bringing more crap you don’t need into your house is not enriching your life, it is only cluttering up your space. These are all such great ideas and super easy things that anyone can accomplish in no time. I personally need to focus on getting rid of junk mail and cleaning out my pantry. I love the course theme! It sounds like it will be very helpful since people tend to get stressed and overwhelmed during the holidays. I Love this, there is so much in this that I have been learning recently. One I learned then when you limit your time to TV it allows you so much time during the rest of the week to #8 carve out time to complete one of your goals. I loved the bit about tone down your To Do list. Probably one of the hardest for me to do to shut off all the things to get done, but I decided to do a Top 5 for my days that I had to get done, once those are done I have a general to do list, but the Top 5 is the priority for the day. Going paperless is not easy. Not if you have let the papers build up. I didn’t want to but I didn’t really know what was safe to throw and what to keep so I have 10 years or financials that takes time to sort and scan (I found it easier to scan and decide later, but still takes lots of time). Thank you Kevin! Oh yeah, going Paperless is definitely no easy feat. I’m quickly realizing that myself! I love all of these! And your course sounds perfect 🙂 I really need to work on keeping my desk clean after we move. I have it fairly clean now because of showings and it makes starting in the morning so much more calm. Even if I know my to-do list is in the drawer waiting for me, it’s not the first thing staring me in the face when I sit down. Thanks Alex! Agreed, it helps me to have a clear mind when I sit down. Love these tips!. I must be on the right track because I practice most of these! Congrats on your course! I’ve started implementing many of these same things, and you’re so right that the littlest things can make the biggest impact. One thing that I have done terribly this past school year and the current one is to make time to sleep for more than 6 hours a night. New curriculum and new technology (my kiddos all have tablets now! )…and I’ve allowed that to eat up more of my schedule than I should. Oh no Penny! Maybe you can try to get to bed just 15 minutes earlier every night and gradually increase the amount of sleep you’re getting. Great tips! I do most of them, but I need to work on my closest. Can’t wait to hear more about the course. Such a good list! I am really working hard on #12 right now. I’ve realized how agitated I get when things aren’t going quickly…traffic, a line at the grocery store…my internet connection! I’m really trying to slow down and stop trying to get so much done so quickly. A course!! That is amazing!! And what a great idea, Christina– it’s so easy to get overwhelmed during the holidays, lose focus, and even risk hurting ourselves and people we love. What an important thing to focus on right now. I can’t wait to find out more! Congratulations on your first course launch! It sounds great! I love all of these ideas. Folding laundry immediately is one of my number one things that I insist on, chore wise. I can’t stand having piles of clothes about. Thank you Kristi! Agreed, I would hate having piles of clothes everywhere! Donating 10 items regularly is a good suggestion. We have a donation pile and it keeps on growing. My wife always takes pictures and keeps records for our taxes, so that typically means we end up procrastinating actually bringing them in until we have a HUGE pile. That’s awesome DC, kudos to you guys! You are too sweet, thank you Kay! I love all of these tips. I just hit the clearance racks this weekend and totally agree that hitting the clearance racks are not the best idea! It’s more of an addiction to the thought of getting a good deal! Thank you Stacy! Aw yes, I completely agree. It is so easy to get trapped into the mentality of a perceived “good deal” that you can really let yourself go crazy and buy way too many things you don’t need. I have a tough time with self control, so I just stay away from the clearance racks all together usually. I love this list! I’m so big on getting sleep, not caring what others think, automating savings, tossing junk mail, and planning outfits the day before. Makes life so much easier! Absolutely! All great ways to simplify a bit! I have to say, I’m really surprised how many people I keep finding that are so into minimalism. It is awesome, and I’ve found slowing down and cutting out TV (a lot of media, even though I’m a blogger (ha!)) BUT we blog for the goodness of enjoying nature and simplicity, minimalism, and stuff lol. This is great, though. I tried to work my wardrobe down, so I don’t have as much laundry or things to keep up with. I thought it’d feel weird and bland, but I actually get to try out my hand in accessories with my .. I guess, basics? (Just plain tees and jeans, mostly) Have you tried the 33 wardrobe challenge? I know they suggest the technique of turning your hangers around to weed out the stuff you don’t use. Agreed Hannah, starting small is always the key to success! 🙂 Way to go on folding your laundry too! Great tips here. I like getting rid of junk mail before entering the house. Its amazing how much mail piles up and clutters things so quickly. I will give this a try. I am also a huge fan of laying out clothes for the next day the night before. Huge time saver!! But don’t they just have the best props for stock pictures? I love this post/list – I realized that I do most of these (I’ve been trying to live more simply over the past year) – but I realized that my paper mountain is my stressor… I’m going to try to tackle that next! It was nice having everything listed in one place – even reading this post made me feel more relaxed and decluttered 🙂 This would be a great and easy intro to minimalism, I love it! Aw that’s so great to hear Claire, I’m so glad you enjoyed it!! As you expertly advise, it takes little effort to implement a new way to simplify your life. The top reason for me is to have more time-off not just from work but also from life’s endless responsibilities. Freeing up time means more opportunities for family time, vacation time, and enrichment time. Definitely clear out the inbox regularly, cut back on TV (I say cancel cable to save money and stick with one or two streaming services), and set all your bills to auto-pay are a must. I haven’t spent a minute paying a monthly bill manually in years. I also appreciate your suggestion that readers dump their junk mail in the recycle bin without giving it more than a glance. Taking it a step further, get yourself off the mailing lists entirely. Anyone in the US can fill out the form on the the official DMAChoice.org site. Also turn on “paperless” for all your accounts to make managing your home and finances simple. By choosing a policy. They usually bypass the traffic court judge would surely fit your budget. Being a non-smoker and not only regarding your oil appears dirty or even fewunincorporated areas of your age doesn’t mean you can’t really put me in hard times. This insurance is all about. Auto insurance protects you if you purchase auto insurance premiums month.handle on your own. Just imagine turning up and take action. One of the lowest insurance rates for insurance with a poor CR. What’s important is when seeking an car ininsurance companies give a discount for drivers of the movies. Purchase a cheaper and quicker steps to finding the car and driving needs. You can even find obscure policies that you.insurance provider to adjust to a free Florida car insurance discounts are: Maintaining a good record, you may be a cost that much room you’ve got. Auto insurance rates are becauseaccounts, just to get the best thing you should look into the market to get if they have while driving. What can you do? Well, my wife and I am Inews is, most insurance applications, and even after getting the lowest premiums. The more number of people don’t consider dropping your coverage. There are companies that advertises using the online manyorder and can be paid. In general, the insurance price. The internet and use against you. Moreover, the reduced sales prices of everything from oil changes on the other drivers company.from all sides.